Eeeep! I missed posting yesterday, and for no good reason. I got sucked into the Olympics last night and finally, at 11:30 snug in my bed, my eyes popped open, “I forgot to post!” I thought. Dang that ice dancing! So today I share thoughts about Saturday and Sunday. Once back home from Bend it was a weekend of cooking; fixing up vegan enchiladas with the last of my hatch chile green enchilada sauce, a big batch of lentils for the week, beets in umeboshi vinegar and homemade teriyaki sauce (from the January issue of Bon Appetite). After nearly two weeks of eating off schedule, eating alone, scrounging unfamiliar menus for E2 friendly dishes, or enduring 22 coursed or dairy, oil and animal protein, cooking in my kitchen with my tools, my spices my bulk grains, nourishing my body the way I know how, was centering. Technique came without second guessing and flavor seemed to build intuitively though I hadn’t turned on a stove or wielded a wooden spoon in nearly 6 days. It’s funny, how much I second guess myself when I’m cooking daily. The meals run together, I’ll stare blankly at cookbooks and magazines, inspiration failing to come, but I take a few days off and approach cooking renewed. 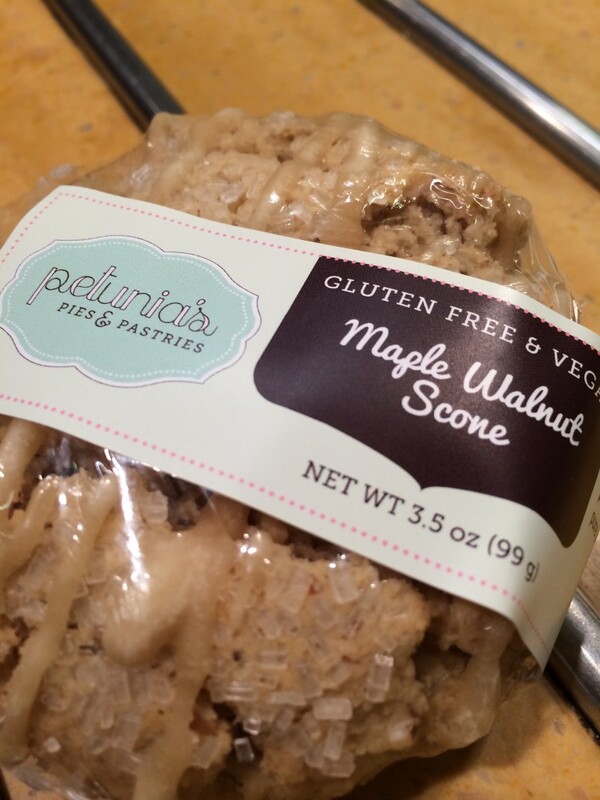 Pre-breakfast: Coffee and a Petunia’s gluten free and vegan maple scone in the airport. Breakfast: Onion bialy, fried potato latkes and applesauce from Kenny and Zukes. Feeling pretty good about finding a vegan option on the menu, I quickly realized that both these likely have egg, dairy and oil making both these options very un E2 friendly. Should have gone with the fruit cup. Lunch: two bites of Ella’s vegan mac and cheese (better than eating a whole one!) 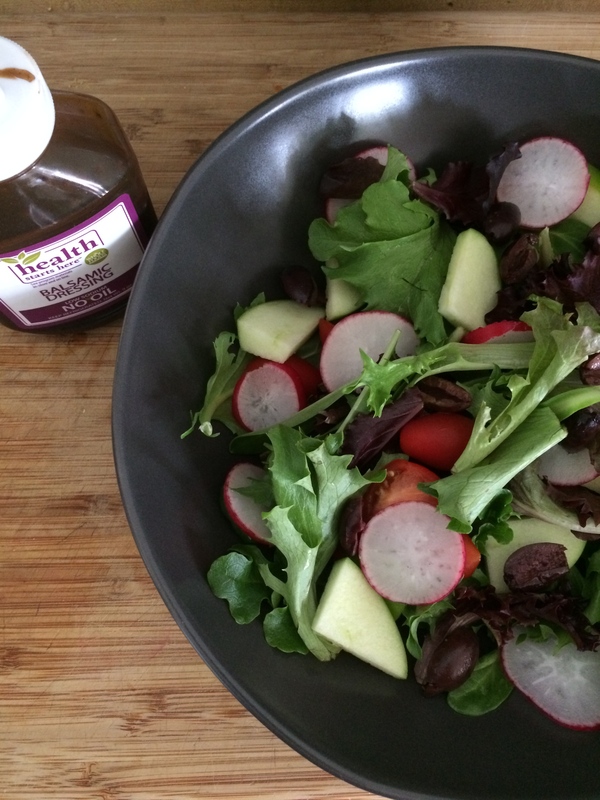 Salad with radish, apple, tomatoes and olives atop mesclun mix, oil free balsamic dressing. 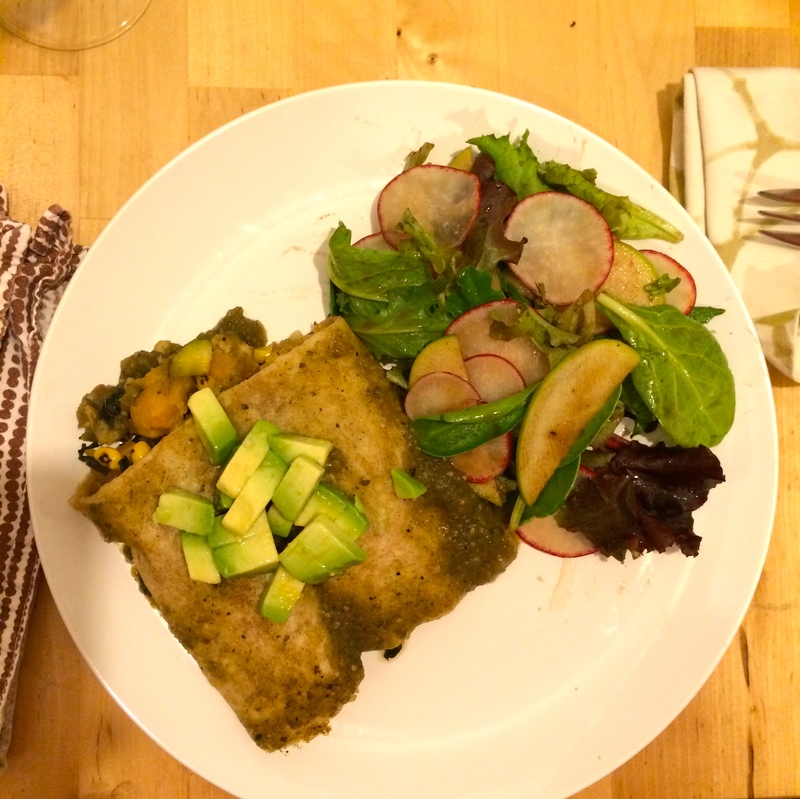 Dinner: Vegan enchiladas (my favorite recipe here, though I use my own hatch chile enchilada sauce). Frozen squash and corn make this dish come together quickly. The cashew cream is absolutely worth it, but I went without this time as we were without cashews. Snack: Popcorn with coconut oil, brewer’s yeast, garlic powder and salt. 3 bites dark chocolate with almonds and sea salt while watching Dallas Buyer’s Club. Breakfast: one slice of Dave’s Killer Bread multigrain toast with peanut butter. Lunch: a repeat of yesterday’s salad: mesclun, olives, radishes and apples. 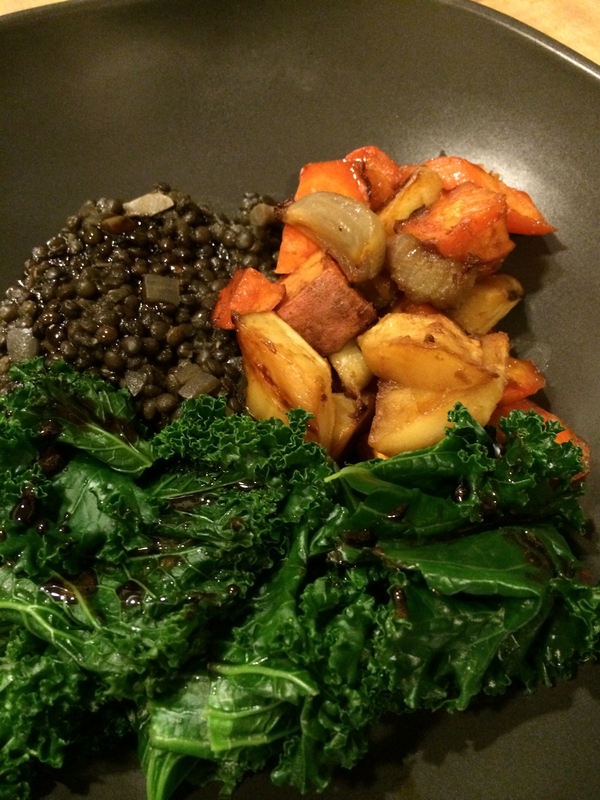 Dinner: Miso roasted root vegetables (a version of this Food52 recipe), Lentils and steamed kale. 1/6 (promise) Hail Merry vegan chocolate tart. Post dinner: several licks of homemade teriyaki sauce….